Total Built-Up Area - 1073 Sq.ft. A special feature like a courtyard turns this simple yet narrow floor plan to much more than just a one story compact house plan. 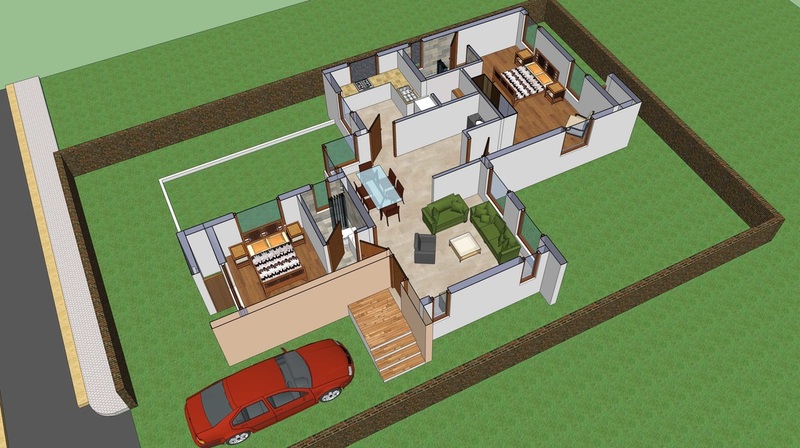 This floor plan in enhanced well with its location of the living space along with dining and kitchen. The two descent sized bedrooms are adjoined by attached bathrooms which are sufficiently large for a nuclear families use. A central dining makes all the sense for a lang narrow house as it holds all the functional rooms together as being the central core of the house which is not the same case with a passage.